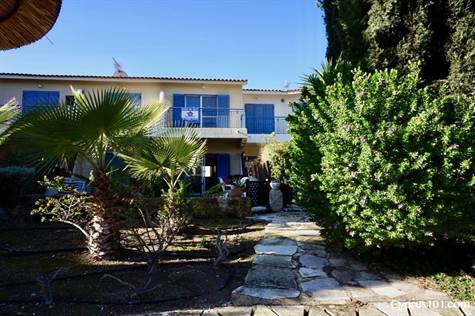 Kato Paphos Resort Property, Paphos – This well presented two bedroom, 2 bathroom mid terrace is situated on a luxury development in the sought after Tomb of the Kings area of Kato Paphos. The coast and all the local amenities you need, such as supermarket, bars/restaurants and bus service, are within easy walking distance. Sliding patio doors in the lounge provide lots of light and easy access to a private, partially covered courtyard garden with lots of space for outdoor dining and sunbathing. It’s nicely screened from the swimming pool and neighbouring properties by fencing and a variety of hedges and shrubs. A pathway leads from here to the stunning mosaic tiled swimming pool and spacious surrounding terrace. In summary, the property is ideally located on a stunning development and is perfect as a “ready to go” holiday home or rental investment. There are full title deeds.